Background: Vinegar could be counted as one of the oldest acetic acid diluted solution products among the history. It can be produced by various fermentation methods using any sugary substrate, especially fermented fruit juice. Due to the presence of many kinds of compounds which formed in the fermentation process, the final vinegar products could show unique functions. The aim of current study was to produce a new type of vinegar kombucha using different fruit juices substrates. 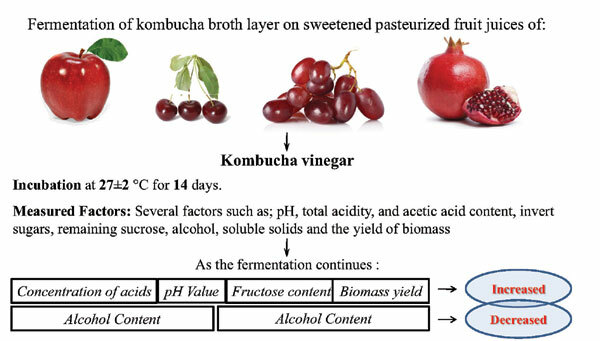 Methods: Kombucha vinegar was obtained by fermentation of kombucha broth layer on sweetened pasteurized fruit juices (pomegranate, red grape, sour cherry and apple). Fermentation took place in 4 L glass vessel and fortified with 2% of previously processed broth. Incubation was carried out at 27±2 °C for 14 days. Several factors such as; pH, total acidity, and acetic acid content, invert sugars, remaining sucrose, alcohol, soluble solids and the yield of biomass were measured periodically (0, 3, 7, 10 and 14 days after processing). Results: As the fermentation continues, the actual concentration of acids, pH value, fructose content and biomass yield significantly increased (P<0.01) but the alcohol and residual sucrose content decreased in all the juices. Contents of acetic acid on 14th day of fermentation were 3.8, 3.6, 3.5 and 3.4 g/100 ml of pomegranate, red grape, sour cherry and apple juice vinegar, respectively. Moreover, soluble solid in kombucha vinegar was determined (24.7, 38.1, 19.1 and 36.5 g/100 ml in pomegranate, red grape, sour cherry, and apple, respectively). Conclusion: The composition of different kombucha preparations is greatly affected by the individual kombucha layer used. Keywords: Acetic acid, beverages, fermentation, fruit juice, kombucha vinegar, substrate. Keywords:Acetic acid, beverages, fermentation, fruit juice, kombucha vinegar, substrate. Abstract:Background: Vinegar could be counted as one of the oldest acetic acid diluted solution products among the history. It can be produced by various fermentation methods using any sugary substrate, especially fermented fruit juice. Due to the presence of many kinds of compounds which formed in the fermentation process, the final vinegar products could show unique functions. The aim of current study was to produce a new type of vinegar kombucha using different fruit juices substrates.